Aldo's, Greenport, North Fork. LI, NY. I have been visiting Greenport for years to visit a dear friend. Whenever I go, I look forward to a coffee at Aldo’s. 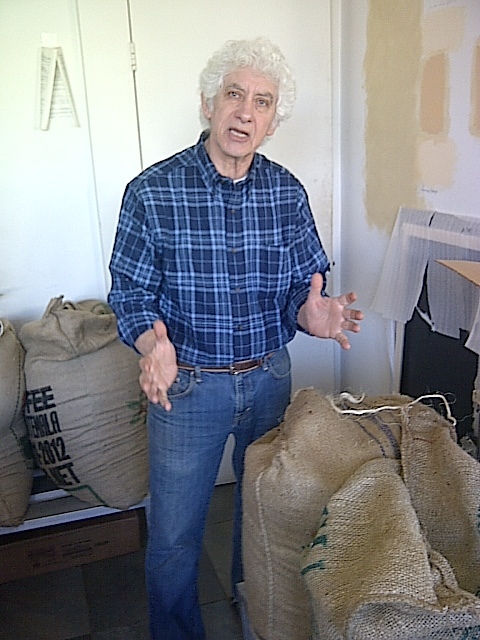 Everyone knows Aldo here, the mad scientist of coffee and the town eccentric. In the old days at Aldo’s, you’d be hard pressed to find a seat-bags of beans were everywhere, with random pages from the International Herald Tribune on crates. Today you can sit comfortably in the café or out back overlooking the docks. Thankfully there’s still plenty of highbrow art and just a touch of lovely madness. On my last visit I woke up early and biked over for a quick espresso. I asked Aldo to recommend a strong blend. His response: “That’s not the way to ask for coffee”. This humbled me. I should have known better. That’s the equivalent of someone asking for “oaky” wine. I reminded him that we met years ago, and that my background was in food and wine. That’s when this quick hello turned into a full-blown interview and I morphed into Michelle the food journalist. When you’ve been in business for a while you recognize an expert when they tell you “I’m not an expert, but….”. That usually translates to “pay attention, this humble genius is going to rock my world and touch my heart with his knowledge”. Aldo has been in Greenport for 34 years since 1978. I asked what got him into the coffee business. His answer? Necessity. He is an Italian who grew up in the South of France. When he came to Greenport two essentials were missing. The first: good bread. The second: good coffee. Today, people come to his cafe daily; in fact some highly caffeinated people are coming 2-3 times a day. People travel from literally all over the world to have his coffee. Some save their moment all the way from JFK for 3 hours East to Greenport to have a cup. His doctor walked in while we were chatting. He checks in on Aldo regularly, as do many people. They bring him wine, eggs, plants, flowers….they can’t wait for his molto gentile greeting, “Buongiorno!”. Yes, the coffee is wonderful, but a big part of the thrill is to exchange a few words with him. He thinks they just want to keep him alive so they can be guaranteed a good cup on the North Fork. A regular customer walked in who requested four bags to travel with. His better judgment was to refuse for fear the beans would not stay fresh, but she was persuasive. 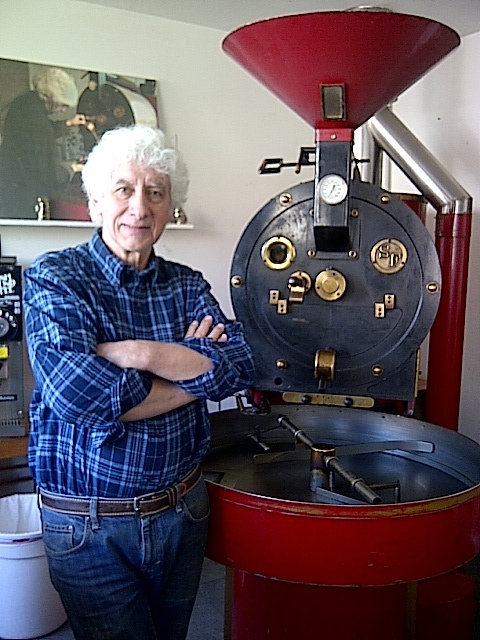 In fact, Aldo only uses an espresso machine to make coffee. It’s not an elitist thing, but he insists on giving his customers a fresh cup every time. 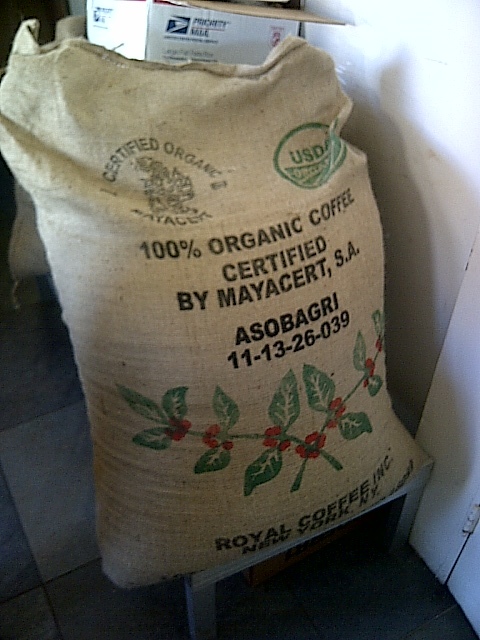 We then walked from the café to the roasting room, where my lesson continued. He opened some bags…. from Guatemala, Ethiopia, Sumatra and Yemen. “With Yemen, you get a big mix…some little, some big, some flat, some round, they look like debris in a way, but it’s the combination that makes it more complex and interesting to me”. He went on to explain the beauty of the Yemen beans. The cherries stay on the tree for a long time to ripen, which makes them less bitter and acidic. 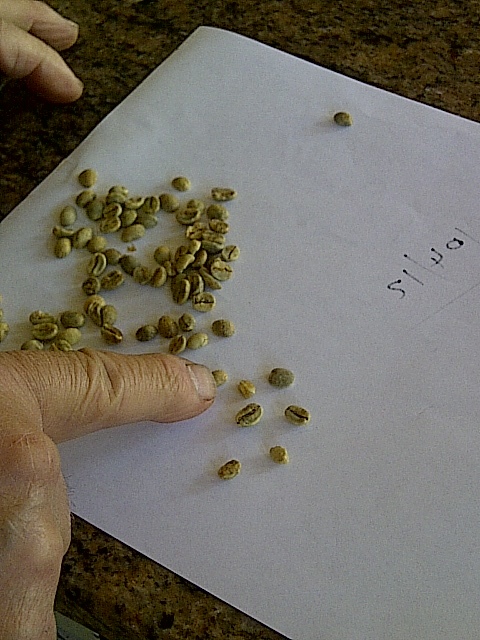 It’s the variety and ripeness that bring the complexity in the cup. Yemen has a wonderfully earthy bouquet that reminds him of aromas of sheep or dried grass in Provence. “These smells are not something I read about, I lived it”. When he first discovered Yemen, he noticed how smooth and pleasant it was. He couldn’t understand why it was so delicious and nearly sweet. Sometimes like sweet chocolate. “You don’t have to look for aromas, they just come to you. This is the connection between smelling and the palate. The whole experience is in the discovery. It’s about making a connection with all items on sensory level. Like fermented compost…cooks are smelling fermented things all the time. That’s how you tell the connection between smell and taste”. It was then realized I was speaking with a man who lives life completely by his senses. Our conversation took a detour from the ripening of Yemen cherries to botrytis (the “noble rot” necessary for sauterne-style wine) and eventually to ripe fruit. An Italian man growing up in the South of France knows his fruit: like Bartlet pears- “when they are ripe they have a gorgeous perfumy essence”. When you buy cantaloupe, you need to wait a few days to get it perfectly ripe. Bananas also have an incredible fragrance. “When you caramelize them for curry sauce, it’s the developed fruit that make the flavors extraordinary. You try to catch the spirit of the fruit itself. That is what cooking is all about”. And you realize this when you taste his scones. “Most people don’t like scones because they’re too heavy and too dry. The English hide them with clotted crème”. He insisted I taste his scone. “Eat the lips”, he said. “You never forget that first kiss” (of the scone). And he was right: this was different, more seductive, more Southern European. The scone was not doughy at all-it was crispy on the rim and indulgently buttery. It melts in your mouth. He insists fresh bread should be eaten cold, because the flavors come together as the bread cools down. “Grocery stores make bread with crust that looks good, but inside it’s too doughy. They charge $5 for something that looks like bread. “Good bread should not be a luxury”. And, that’s why he has always made his own bread. And so, to understand Aldo, you need to taste his coffee. You need to taste his scones. 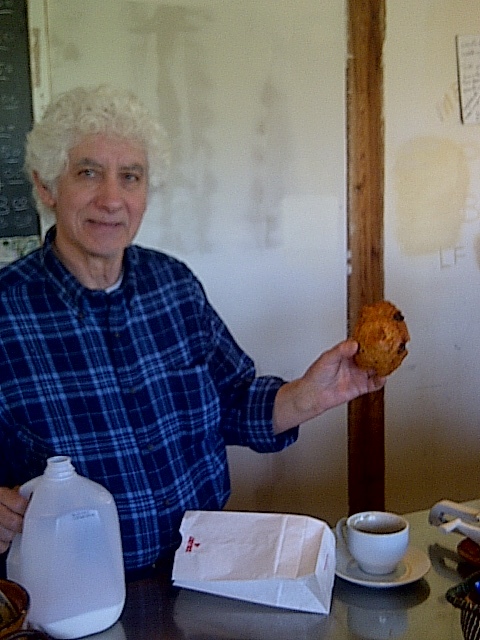 But don’t’ break the scones (as I was corrected) take the whole quarter of the scone into your mouth. Enjoy every morsel. That’s living. ← Happy Summer 2012 from joyful plate!